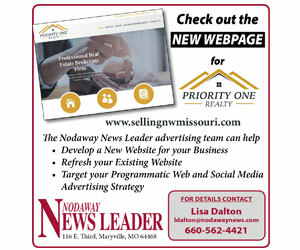 This week is a special week at the Nodaway News Leader. Every year we salute our small business operations by allowing them to tell their stories in a promotional spot. Over 35 area firms joined our efforts to sell you, our loyal readers, on their services, products and abilities to serve your needs, right here at home. Why use the internet to buy your goods, wait for the UPS guy to deliver and then most of the time, send it back because it’s the wrong color, size or simply not what you wanted? So much effort for a simple feat of you making a purchase. Then to make the situation even more complicated, what if the gadget fails to perform a short time after you get into your home. Who will repair it? So many times, you call on our local experts to fix something that they didn’t sell to you. And that is if you’re lucky enough to discover a local repair person. That doesn’t always exist. Let me tell you, I don’t have the time or patience to go down this path. Instead, I would rather put the effort out at the beginning of the purchase decision and see the product, feel it and try it on from one of our local retailers. They can even assist me if I have questions. I didn’t have to fill up my gas tank and drive to the city, where it always takes more time and more money to shop. Traveling even 50 miles equates to nearly $10 added to my purchase price. That does not include the additional items you might grab and probably a meal. There’s another angle that shoppers need to think about before an out-of-town purchase or an online order is made. The local merchants, who are your neighbors, golf team partners and sit in your row at church, are the people who support your son’s baseball team, give to United Way every year and purchase Girl Scout cookies. The people who operate these small businesses are trying to make a decent living for their family and are the ones who donate to our community. These donations help create the quality of life that we so enjoy in our small community living. Your purchase here at home will make all the difference in the life and profitability of local businesses. The next time you need a gallon of paint, some new shoes or a fresh quote on your homeowners insurance, just take the simple path. Shop local.